← Is it Time to Reduce Your Carbon Footprint? 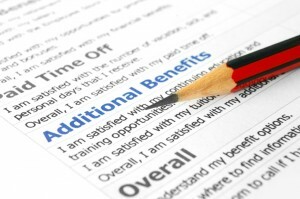 Your employment benefits are part of your compensation package. They don’t come in the form of cash, but the company that you work for pays into them, and you should use them. I wrote a post about this about a year ago, and I am still committed to using my benefits to the maximum. You are short changing yourself if you don’t. I have some great benefits with my work. In 2013, I used almost $7,900 worth of employment benefits. My employer provides a statement at the end of each year, with a summary of the amounts I used. There were a few benefits that I had to pay a portion of, but I knew this before I used them, and a few that I had to pay upfront and be reimbursed for. Massage therapy is a benefit that I use regularly and I really enjoy. Many companies offer massage therapy, up to a certain amount per year or month. While massage therapy isn’t the same as a spa massage, it’s still beneficial for your muscles, especially if you have a desk job that requires you to sit for a long period of time. Massage therapy isn’t just for your back, either. Since I type so much, my massage therapist does some work on my wrists and hands that really helps. You typically won’t have a health spending account and additional health benefits, but a health spending account gives you a certain amount of money to spend on health care, without putting restrictions or limitations on what you spend it on. This works really well for people who may have unusual medical needs. For instance, if you have allergies in the spring time, you can use some of the money in your health spending account for naturopathic allergy remedies. Everybody’s needs are different, so health spending accounts are a nice way for an employer to recognize that. Another huge benefit of working for my employer is life insurance. I do still have to pay for it for my partner, but it is at a huge discount as opposed to getting life insurance from another source. Life insurance up to 3x my annual salary is free for me, and then a little extra to add amounts on (ie an additional $40,000 for $2). This is not something that public sector employers offer, so I am out of luck on this one, but private employers often offer tuition reimbursement plans. The employer will reimburse you up to a maximum amount for any tuition expenses that you incurred getting the education you needed for your job. I can’t think of a reason not to take advantage of this, though I had a friend who didn’t even know her company offered this benefit until years after she began working for them. It was a happy surprise for her. This is something that many public sector and unionized workplaces offer their employees, and I can imagine that it’s a nice benefit to have! Parental or maternity leave top-up provides you with a percentage of your wage when you go on leave above what employment insurance pays you. For instance, if employment insurance pays you 55% of your regular wage when you are on leave, an employer might top up that payment up to 85% of your wage and pay the difference. I don’t know about you, but this is the ultimate benefit for me. My time is important to me, so having a flexible schedule (ie being able to work 10 hour days, 4 days per week and having the 5th off) and earned days off would be ideal. Unfortunately, this is not a benefit that I enjoy but many companies are beginning to give their employees. Do you have any of these benefits? Do you make it a priority to use them? My friend that is a real estate agent told me that her company give them a massage therapy twice a year. Their company is very well-known as a very good company to work to with good benefits that surely their employee will enjoy. That’s great – massage therapy is actually very helpful! Free products is great too – does T’s work have benefits? I have to look into whether my employer offers massage therapy as a benefit…I love a great message. Definitely look into it. I am surprised as to how dependent I am on massage therapy now. Yea, I’d like to have the massage therapy benefit. Tuition reimbursement was a benefit I really would have liked when I went to grad school part time in the evening. I work in the public sector but didn’t have any parental top-up benefit…I did have a decent amount of leave accumulated which I took when my son was born. It does depend on the public organization and of course the country you live in. At least you had leave! Good list, here are some other tax free employee perks: employee stock options (potentially lucrative and only taxable when exercised), company paid cell phone, non cash employee gifts (up to $500 per year), overtime meals and allowances, relocation costs and company-paid education costs. With a company paid cell phone, my understanding (in the organization I work in, anyway) is that it’s only for company business. Everyone that I work with has to have an additional cell for personal stuff, but it’s still a nice perk! I’ve got an HSA, flex time, and tuition reimbursement (which I totally use and love), but unfortunately our benefits don’t cover massage therapy. However, I can use the HSA dollars to pay for it. I think the perks of full-time jobs are often overlooked, as everybody is focused on salary without considering the added value of additional benefits. I don’t know whether I’d rather have regular dental and health benefits plus massage therapy, or an HSA. HSA is a huge perk!